Baldwin’s poignant and, oftentimes, painful letter went on to be the cornerstone of The Fire Next Time, which shone a spotlight on America’s inability to deal with its deep-seated racism. These days, what the world has done to black folks is evident in the myriad unarmed black women and men cut down by those in power, and our defiant plea that no matter what happens to us, black lives still matter. 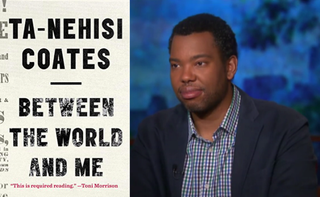 Against this backdrop of extrajudicial killings and massive protests, The Atlantic’s Ta-Nehisi Coates took a cue from Baldwin and penned a letter to his 15-year-old son, Samori, about America’s treatment of its black citizens. The result, Coates’ latest tome, Between the World and Me, takes an unflinching look at America and its mythological dream. Dreams we’ve been sold since birth—of equality, of access, of the chance to achieve. These dreams have been handed down through folklore, through spirituals, through calls for freedom, through sanitized Martin Luther King Jr. quotes. But as Coates writes, “The Dream rests on our backs, the bedding made from our bodies.” The dream, he surmises, just doesn’t exist for black people in America. Coates’ discussion about what America has built on the backs of black bodies has been hailed as revelatory. Critics have called the book “extraordinary” and “essential.” Toni Morrison, matriarch of the black canon, said it is “required reading” and proclaimed Coates heir to Baldwin’s venerable legacy. But like Baldwin, and so many other revered writers and thinkers who have grappled with being black in America—from Frederick Douglass and W.E.B. Du Bois to Richard Wright and Ralph Ellison—Coates’ exploration of the black experience once again sidelines women. In Between the World and Me we get a potent, full-throated description of young men and boys who stumble, fight and in some cases f—k their way through America, attempting to negotiate a world that is built on rendering them powerless. The young men of Coates’ youth “transmuted their fear into rage,” taking out their aggressions on one another in neighborhood battles for respect that the outside world refused to give. But what of the women? In Between the World and Me, black women are footnotes to the men’s stories—baby mamas, lovers, mothers, classmates, around-the-way girls, grieving mothers. As Coates recounts a world full of complex black men carrying the weight of the world on their shoulders, the same can’t be said for the women who bop down the same blocks, negotiate the same demons and are often victimized by the same men. As one reads Between the World and Me, it’s easy to get caught up in Coates’ brutally descriptive prose and his startling assertions about whiteness. At times I found myself getting lost in his world, and his ongoing conversation with his son hit me in the heart as a mother. Indeed, Coates is a writer’s writer whose pen game is so strong, I almost forgot that the black women in Between the World and Me are relegated to the same margins from which bell hooks hoped to escape. To be clear, Coates’ book is intensely personal, so his perspective as a black man writing to and about black men is somewhat expected. As he discusses the effects of systemic racism and capitalism on black bodies, he does so through the prism of his own life growing up in West Baltimore, attending Howard University and working as a writer in New York City. Still, I'm disappointed that yet another widely praised, “must-read” book about the black experience in America treats women like satellites of their more important male counterparts. In the final section of Between the World and Me, Coates finally turns his gaze on a black woman. Dr. Jones, the mother of Coates’ slain friend, Prince, made her way from rural Louisiana to become the chief of radiology at a local hospital. Despite her amazing climb, the privileged life she provided for her son could not protect his body from being destroyed by a police officer who mistakenly snuffed him out. Dr. Jones, like many black mothers, fears it could happen again. “She was intensely worried about her daughter bringing a son into America, because she could not save him, she could not secure his body from the ritual violence that had claimed her son,” Coates writes. Though he shares Dr. Jones’ story, Coates uses it to once again talk about America’s tendency to destroy black bodies—black male bodies. But the “ritual violence” that America administers isn’t reserved for black men. Black women and girls are beaten, incarcerated and killed by those in power and by those who claim to love them. But where are those stories? As I read Coates’ book, I couldn’t help wondering why black female writers aren’t lavished with the same level of pomp and circumstance given to black male writers who write about race—or hailed as the second coming of Baldwin. After all, Coates isn’t the only person grappling with these issues today. In fact, black female writers, like Michelle Alexander, Nell Painter and Isabel Wilkerson—three women he’s mentioned in his blog—heavily influenced his work. Though some will assert that Coates’ book is one man’s perspective on the world, the accolades given to Between the World and Me have transformed this slim volume into more than just a memoir; rather, it’s a meditation on what it means to be black in America today. And apparently, 40 years after the inception of the Combahee River Collective, all the blacks are still men. Mother Morrison was right: Coates’ ambitious book is required reading, but not to understand the “black experience.” For that you’ll have to read his book in tandem with the writings of black female scholars like Barbara Ransby, Crystal Feimster, Deborah Gray White, Tamara Winfrey Harris and Blair L.M. Kelley. Only then will a fuller picture of black life start to come into view.